Saving Jeremy Corbyn- Who are the real anti-Semitics here? It is appalling to be British and observe the circus of hysterical, ridiculous accusations being flung at Jeremy Corby by the Jewish Board of Deputies and their conservative and labour cohorts. I wonder if these self-righteous accusers have any perception of how we are viewed from afar by the more sane countries around the world. There is a simple question to be asked here; “Is Jeremy Corbyn racist?” Well the answer to that is so self evident that those who accuse him wouldn’t dare ask it. Jeremy Corbyn has a long history of standing up for truth, justice and for all of those who find themselves under attack through social injustice and poverty. Were he to be Prime Minister it would bring a breath of new life into our occupied Kingdom, held hostage by money, power and corporate lobbyists. That is…. were all of his labour party members to stand up and support him. Hamas are accused of using human shields in Gaza. The accusation is ridiculous for anyone who has actually travelled to Gaza. It’s such a tiny strip of land that its civilian population is crammed together. As is being demonstrated now, Palestinians can’t even venture within a kilometre of the perimeter of their permitted imprisoned land without being teargassed or shot at. Most of the protestors, the medics and journalists, are young men and women from within families who are trying to defend their families from Israeli genocidal policies. And really who of us wouldn’t? I salute them. On the other hand we have here in Britain a largely privileged group who are shielding their unfounded attacks on Jeremy Corbyn behind a claim of being Jewish. So what if they are Jewish. This doesn’t give them the right to espouse such wild accusations…, to speak for other Jews – and certainly not all British Jews, as they falsely make claim. I have many wonderful Jewish friends who are either appalled by their behaviour or have never even heard of them. From my perspective I would say that brandishing this shield of their individual Jewishness is intimidatory and exploitive. In a metaphorical sense they are the ones using innocent British Jews as human shields. In fact one might even debate whether this could be seen as a variation on a hate crime, because there are those who still take the word of the mainstream media literally and who do think these unfounded attacks are coming from all Jews. In making such a claim aren’t they just shifting criticism away from themselves as individuals and placing it on the shoulders of British Jews, thus attracting ridicule and a potentially frightening risk for real anti-semitic attacks. We are all inter-connected in this beautiful natural world. I hope that oneway we will ALL awake up to this and instead of attacking such stalwarts as Jeremy Corbyn we will celebrate our differences and thus avoid diving into dark oppressive rabbit holes of gobbledegook politicly motivated distortion. Racism is defined as “believing that one race is superior to others”. Lacking a distinctive DNA the “Jews” are NOT a RACE. Being a “Jew” is nothing more than being a member of a religion with several denominations and the ‘initiation ceremonies of the Bar and Bat Mitzvah are the points when one becomes a “Jew”. Being an “anti-Semite” is nothing different than being in opposition to Judaism. Judaism is no different than any of the other religions that humanity has invented; or will invent in the future which are designed to “include” those who believe and “exclude” those who do not. 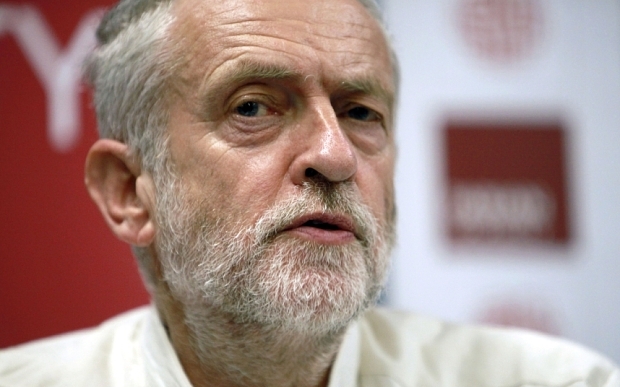 Unfortunately, Jeremy Corbyn is an exception in the war-loving, imperialistic, principle-free British Labour Party.